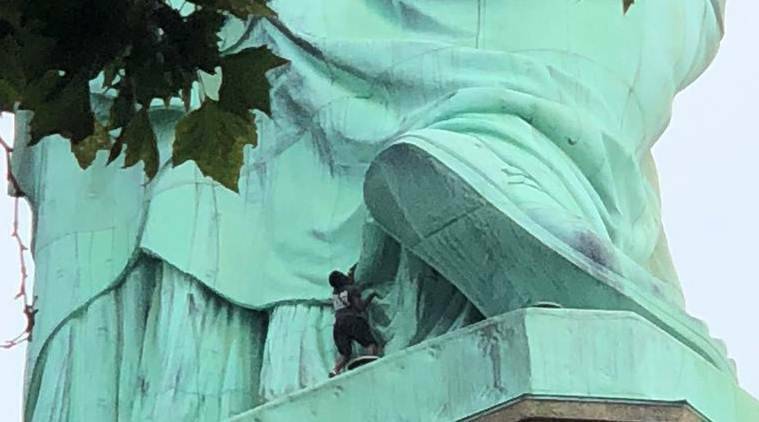 With the dramatic scene unfolding on live television, she and the officers edged carefully around the rim of the statue's robes toward a ladder, and she climbed down about 25 feet (8 meters) to the monument's observation point and was taken into custody. 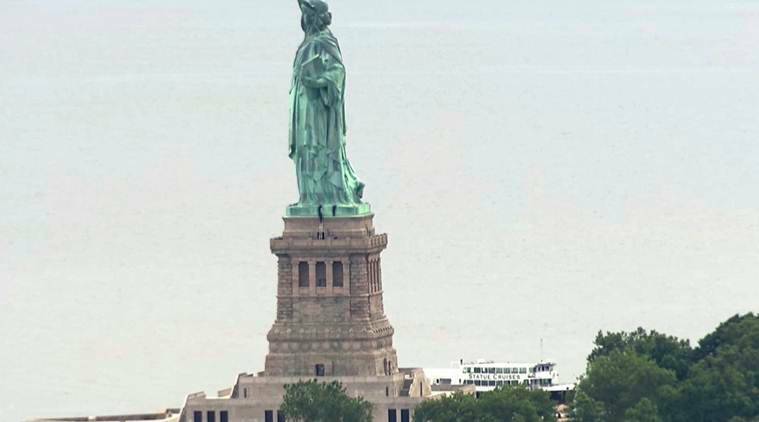 A woman protesting U.S. immigration policy climbed the Statue of Liberty’s base and forced the monument’s evacuation on the Fourth of July hours after several other demonstrators had hung a banner on the statue’s pedestal and had been arrested. About 100 feet (30 meters) aboveground, the climber engaged in a roughly four-hour standoff with police before two New York Police Department officers climbed up to the base and went over to her. 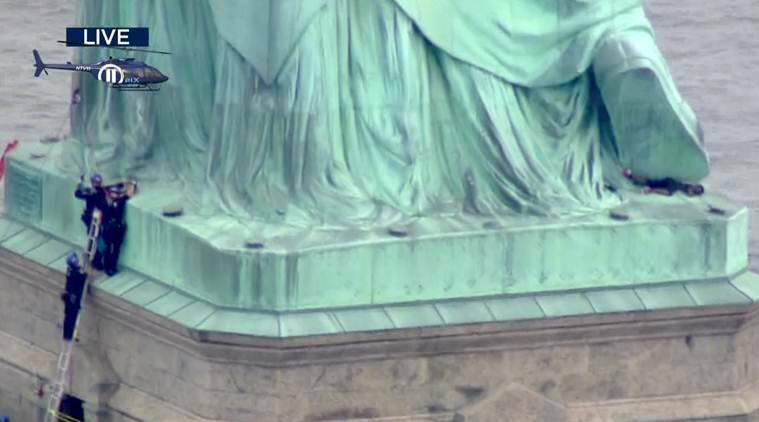 With the dramatic scene unfolding on live television, she and the officers edged carefully around the rim of the statue’s robes toward a ladder, and she climbed down about 25 feet (8 meters) to the monument’s observation point and was taken into custody. The woman had participated earlier in displaying a banner calling for abolishing the federal government’s chief immigration enforcement agency, said Jay W. Walker, a member of Rise and Resist, which organized the demonstration. The group initially tweeted that the climber had “no connection” to the demonstration. Walker later said she was involved but others had no idea she would make the climb, which wasn’t part of the planned protest. He said he didn’t know her name. The climber ascended from the observation point, National Park Service spokesman Jerry Willis said. Visitors were forced to leave Liberty Island hours before its normal 6:15 p.m. closing time, he said. Earlier and farther below, at least six people were taken into custody after unfurling a banner that read “Abolish I.C.E.,” Willis said. The message referred to Immigration and Customs Enforcement, a part of the Department of Homeland Security. ICE officers arrest and deport immigrants who are in the United States illegally, among other duties. New York-based Rise and Resist opposes President Donald Trump’s administration and advocates ending deportations and family separations at the U.S.-Mexico border. U.S. Attorney General Jeff Sessions has said the president’s immigration policy is a step forward for public safety. Under public pressure, Trump later halted his policy of taking children from their detained parents. A federal judge in California ordered the Trump administration late last month to reunite the more than 2,000 children with their parents in 30 days, or 14 days in the case of those under age 5. “Abolish ICE” has become a rallying cry at some protests around the country and for some prominent Democratic officials seeking to boost their progressive credentials. Protests and evacuations at the Statue of Liberty are rare but not unheard of.